Business secretary Sajid Javid has told phone provider O2 to "sort it out" after complaints about users losing signals on their mobiles. 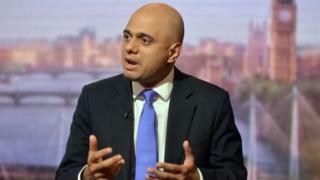 Conservative MP Mr Javid tweeted: "No signal @O2. Please sort it out." People in London, Manchester, Bristol, Birmingham, Glasgow and parts of Northern Ireland have reported issues. O2 said it was aware of "isolated instances" of intermittent service across the UK, and it was investigating the situation. The company has responded to complaints on Twitter by advising people to reset their device, and visit its support page if problems persisted. O2's online network status checker said phone masts were currently not working in several areas, including London. Many O2 customers took to social media to complain of not being able to send and receive calls and text messages, as well as problems with 3G internet signal. Craig Newrick, who lives in Lowestoft, Suffolk said: "I have contacted O2 and got told to switch my device on and off again. It is really not good enough. "What am I paying for?" Others complained that the response to customers' complaints from O2 had been inadequate. Aaron Nelson tweeted: "The impersonal, predictable and robotic style of responses from @O2's Twitter is an embarrassment. Still learning the internet?" 02 spokesperson said: "We are aware of isolated instances across the UK where some O2 customers are currently experiencing intermittent service. "We are investigating the situation and will update as soon as possible."